Summary: This is a far broader and more exciting use of Li’s agility while Yeoh and Siu-ho provide excellent support. 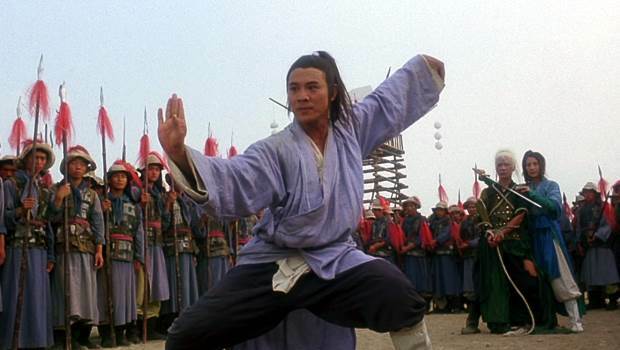 Back before Hollywood distracted Jet Li long enough to see him dedicate his time to trashy rap-inspired action thrillers or wafer-thin roles in blockbusters, he was producing and starring in martial arts classics like Tai Chi Master. Stripped of American gloss and steeped in Asian traditions, the simple but effective filmmaking from 1993 has a charm lost on translations into western productions which have tried to take his skills and implant them into movies that have generally fallen flat. Here Li is joined by Crouching Tiger, Hidden Dragon’s Michelle Yeoh and directed by The Matrix choreographer Yuen Woo-ping for a real showcase of his talents. Tai Chi Master sees two young orphans Junbao (Li) and Tianbao (Siu-ho) become best friends as they are raised in the legendary Shaolin Temple watching warriors train. The cheeky monks often fight between themselves to see who is stronger – getting into trouble while they are at it. In a fight for promotion up through the Shaolin ranks, Tienbao almost kills another student for using a concealed weapon no-one else sees. Junbao supports his friend but a brawl erupts which results in the pair being banished from the temple. Initially the two travel together to learn life outside the temple, meeting up with local rebels including Siu Lin (Yeoh) who fight for the freedom of their people. But when Tienbao seeks to fulfil his ambitions on a barbaric rise to power, the two ultimately come face-to-face in a deadly scenario. The tale of childhood friends becoming enemies is a simple and effective foundation for a blend of a comic beginning leading to a darker conclusion in true Asian style: there’s plenty of slapstick and misunderstanding between Junbao and Tienbao while the fight scenes are more gentle exercises at the start. As events become increasingly dangerous, so does the ambitions of Woo-ping’s direction and choreography. Inventive fight scenes see Li using barrels to defend himself, piling them up and blasting them back at his opponent, and an impressive display of bo skills as he uses his speed to dodge and block an onslaught of assailants. This is a far broader and more exciting use of Li’s agility while Yeoh and Siu-ho provide excellent support. Tai Chi Master captures Li at his finest – the closest recent performance to match what’s on offer here is Fearless which saw him return to Asia to tell the story of Chinese Martial Arts Master Huo Yuanjia with Woo-ping back on set to work the martial arts magic. However, to see Li in his prime, this is a must.